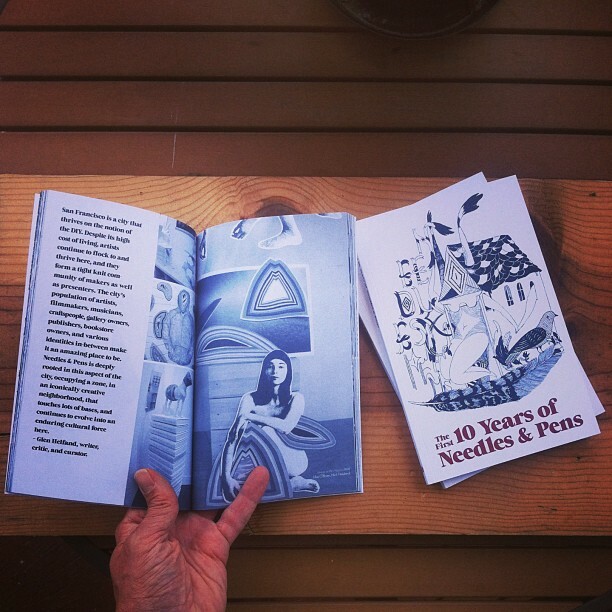 The First 10 Years of Needles & Pens book is now available for purchase online. The First 10 Years of Needles & Pens documents the over 85 art exhibitions and events hosted by the unique San Francisco arts space. For the last 10 years N&P has specialized in zines, handmade goods and visual artwork in a gallery setting. This book celebrates and reflects on the last decade of the space’s history through photos and words by the people that have been involved. People like: David Benzler, Patricia Colli, Chris Duncan, Kyle Field, Maria Forde, Glen Helfand, Jay Howell, Rich Jacobs, Chris Johanson, Tim Kerr, Darin Klein, Faythe Levine, Nick Mann, Austin McManus, Griffin McPartland, Serena Mitnik-Miller, Sam McPheeters, Matt OBrien, Nigel Peake, Ray Potes, Larry Rinder, Chris Reardon, Oliver Halsman Rosenberg, Nathaniel Russel, Andrew Schoultz, Orion Shepherd, Paul Schiek, Jovi Schnell, Andrew Martin Scott, Louis Schmidt, Kevin Earl Taylor, John Trippe, and Paul Wackers.